With the World Cup being played in Brazil at the moment, I have found another animal that comes from there. The Brazilian Wandering Spider is also the very first invertebrate that I have written about on this blog. They are the most venomous spider in the world and a single bite can kill a person. They can grow to up to 15cm in length. Instead of building webs or living in tunnels like most other spiders, they hide during the day and go hunting at night-time. They catch insects, other spiders, and even frogs, mice and small lizards. Despite their name, Brazilian Wandering Spiders are not confined to Brazil, but are found in forests throughout Central and South America. They are also called the “banana spider” because they often hide in bunches of bananas that are then harvested and sent to overseas markets. Imagine finding one of them in your groceries when you get home! 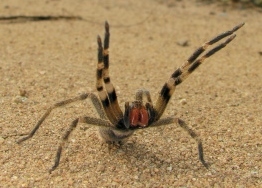 Are there any other interesting facts that you would like to share about Brazilian Wandering Spiders?